My name is Dr. Kimberly Carbo and I have spent over 14 years working in the world of college athletics. I have served in a variety of capacities including sports information, marketing, development, fundraising, and special events. 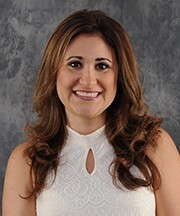 Most recently, serving as the Assistant Athletic Director for Marketing, Development and Fundraising for Nova Southeastern University (NSU) in Ft. Lauderdale, Florida. While at NSU, I was responsible for creating and implementing marketing strategies to increase fan attendance, revenue, and both internal and external support for each of NSU’s 17 intercollegiate teams and the overall athletic department. My duties also included the oversight of the Shark Club, the official booster club of NSU Athletics, sponsorship initiatives, game promotions, and community engagement. Athletics has always been a part of my life - whether it be as a spectator or participant. I have also worked in professional sports, for the Miami Fusion, Columbus Crew and NY Red Bulls of Major League Soccer and the Columbus Blue Jackets of the National Hockey League. However, college athletics was where my passion lied. I went to The Ohio State University, where I played soccer and earned a Bachelor's degree in Communications. I earned a Master's degree in Sports Management, as well as a Doctorate degree in Organizational Leadership, both from NSU. In my spare time, I enjoy spending time with family, exercising, and making trips to the dog park. I am also an avid snow skier.